20SomethingMum has been trying out some luxury bedding and girly pillows. I may be an unusual breed for a woman, but I have never been one for spending lots of money on bedding and cushions for my bedroom. To me, a bed is for sleeping in, and the idea of lots of little cushions and throws on the bed which will inevitably end up chucked on the floor at bedtime, and gather dust during the day seems a bit pointless to me. The most expensive bedding I ever bought was some "satin" sheets and duvet cover as they were in a very deep purple shade-but these are now shoved at the back of the airing cupboard because they were the most annoying things to sleep in ever-ice cold and slippery in winter and boiling hot and sticky in the summer. 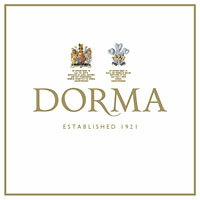 I had never heard of Dorma in my life, my bedding when I do buy it, is usually bought from the supermarket. I had a look at their website at www.dorma.co.uk, and shockingly, I now want to redecorate my bedroom! The site is very easy to maneouver around, with bold headers depending on what department you are looking for. They have recently branched out into bathroom and dining room accessories too. The bedlinen is the sort I can imagine in a very posh hotel, the photos used on the site are bright and can be magnified by passing the mouse over the main picture. The site also makes it easier to see what comes in a certain range, by having links to matching cushions and throws in the range on each page-sort of the serving suggestion of bedlinen! There is a great range to choose from-my favorites were the Genoa and the Keira sets. The towels in the bathrooms collection look like I wish my towels did-fluffy, soft and whiter than white, the sort that would make you want to have 4 baths a day just to wrap in their softness! The thing that is not surprising is the price. A duvet cover starts at £65, and the small cushion I received is £30 itself. Slightly out of my price range, which is a shame as I have really started to see what the bedroom fuss is about with some of the gorgeous ranges and bed dressing in the pictures! It might be an idea to sell a cheaper range, for those of us currently feeling the pinch. The quality of the cushion I was sent is great, The Tot Testers have run off with it and one refused to sleep without it last night! It is soft and just the right size to cuddle. The pillowcase (from the Belvoir collection) is simple, and feels good quality, thick and will last a good few washes too. Thanks Dorma, although out of my price range, I'd love to pinch some of your design ideas, and for finally making me understand the need for small cushions.They make my daughter sleep.